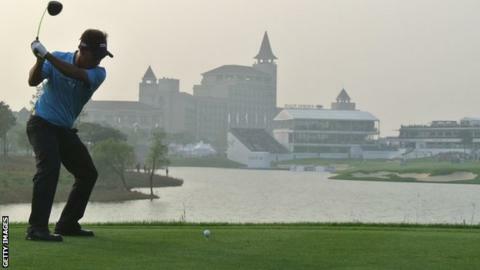 Thailand's Thongchai Jaidee will take a one-stroke lead into the final round of the BMW Masters after carding a six-under 66 on day three in Shanghai. The 46-year-old, who birdied five of his opening eight holes, is 15 under. Denmark's Lucas Bjerregaard, who led by three at the halfway stage as he seeks a maiden European Tour title, had a two-under 70 and is tied for second with Sergio Garcia and Byeong Hun An. English trio Ross Fisher, Paul Casey and Ian Poulter are 12 under. Fisher, who lost out to Marcel Siem in a play-off at this tournament last year, chipped in from heavy greenside rough at the par-three 17th for one of his six birdies in a five-under 67. Jaidee, who won the last of his seven European Tour titles at the European Open in September, dropped his only shot of the day on the 18th to leave the top 15 separated by just five strokes at the penultimate event of the year. Marcus Fraser moved up nine places to joint-11th after playing his last nine holes in 29, culminating in an eagle at the 471-yard 18th by holing his second shot from 231 yards. Danny Willett, who is second in the Race to Dubai standings, carded a round of 70 to be in a tie for 27th place. English duo Justin Rose and Matthew Fitzpatrick both had rounds of 67 to reach 10 under overall. Players and caddies wore black ribbons to commemorate the Paris attacks, in which at least 127 people and more than 180 were wounded. The seven French players in the field agreed before play they would wear black as a mark of respect if they had that colour of clothing with them.